‘The Christmas Cave’ in Minford is managed by, (left to right): Lori and Bryan Davis, Tom and Mindy Martin, together with other board members of the White Gravel Mines Productions. Among the displays featured in ‘The Christmas Cave’ in Minford. 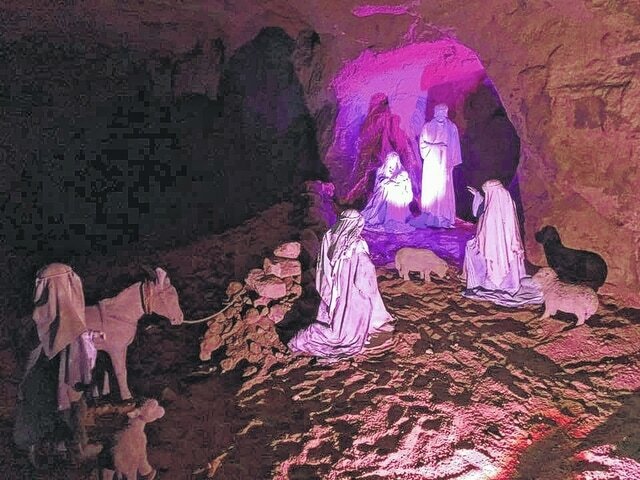 Scenes telling the story of the Nativity are featured in the ‘The Christmas Cave’ in Minford. MINFORD — The Christmas Cave, located at 4007 White Gravel McDaniel Road in Minford has attracted thousands since the doors opened Nov. 25. The Christmas Cave is a new, self-guided tour which provides scenes which reveal biblical accounts of how the actual Christmas story unfolded. The Christmas Cave is managed by Tom and Mindy Martin, along with Bryan and Lori Davis. Together with the faithful board members of the White Gravel Mines Productions (WGMP), their mission is to educate everyone about our Savior’s birth. Bryan Davis of WGMP, said he is overwhelmed by the response to The Christmas Cave. Lori Davis, of WGMP, shared a series of comments from some of the visitors of the Christmas Cave. Lor Davis said a review from Serena Miller who visited The Christmas Cave is her favorite. “I wish there was a higher rating I could give the Christmas cave. To think that this beautiful experience was created by a group of locals makes me so proud. It is a first-class experience. Talked to one of the volunteers and found out that they made hose gorgeous statues themselves. I figured they’d had to order them from some museum in New York or something. Our family group consisted of an 82 year old all the way down to a 3 year old and every one of us were in awe,” Miller said. The Christmas Cave is open every Friday and Saturday from 4 p.m. to 10 p.m. until Christmas Eve. It is free and open to the public.